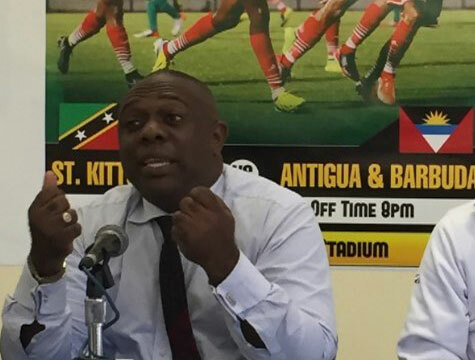 With Warner Park Football Stadium playing host to the St. Kitts-Nevis Football Association (SKNFA) Playoffs, stadium officials are confident that the venue would hold up for the June 1 Caribbean Cup encounter with Dutch-speaking Suriname. Concerns had been raised about the location of the game following the shifting of the last portion of matches in the SKNFA season away from that venue, as the association deemed the surface unplayable and needing rest with the Caribbean Cup in mind. That followed the announcement that the cricket venue at Warner Park was unavailable due to international cricket commitments in all of June. Addressing reporters at a recent press conference, President of the SKNFA, Anthony Johnson explained based on the feedback his association received the stadium is likely going to be in a suitable condition to host the international match. The St. Kitts-Nevis National Football team dubbed the Sugar Boys, successfully topped their group in the opening round of the Caribbean Cup when they edged archrivals Antigua and Barbuda 1-nil and brushed aside Aruba 2-0. With their progression to the second round, the Sugar Boys will do battle against Suriname and St. Vincent and the Grenadines. President Johnson disclosed that the league would take a break during the playing of matches in playoffs to facilitate international duties for several of the players. Meanwhile, the issue surrounding the lights at the Warner park stadium remains and Johnson during the press conference at Football House expressed his displeasure at the long wait to have the problem rectified. He reminded reporters that prior to the World Cup qualifying game against El Salvador last year, his association approached the Government to for assistance to enhance the lighting at Warner Park. This came to the local association knowledge when FIFA officials did a venue inspection before the qualifying match, where it was disclosed that the lights are below what the governing body recommends. President Johnson noted that the government sought and received assistance from the Republic of China on Taiwan, but when the necessary equipment arrived it was installed at another location. The Opposition SKNLP has been very critical of the government in recent weeks, specifically the Minister of Sport, Shawn Richards, as they claimed that he changed the location of the lighting.